Yesterday I took a vacation day to celebrate my daughters 6th birthday with her. I still went in to work for 45 minutes to order feed but hey, 45 minutes is better than 10 hours. So it was awesome. This morning I get out of bed, late. I go to make Addie a peanut butter and jelly sandwich for lunch. There is no bread. So I go to the freezer to let some thaw out for later. I open the freezer and blood starts pouring from the door. Over 200 pounds of chicken and 50 pounds of elk meat have partially defrosted. The chicken wings in the freezer door, completely thawed. I quickly transfer everything to the other freezer. Except the bottom packages that have re-frozen and stuck to the shelves under a layer of ice crystals. And the chicken wings went into the fridge for dinner tonight (they were still very cold). 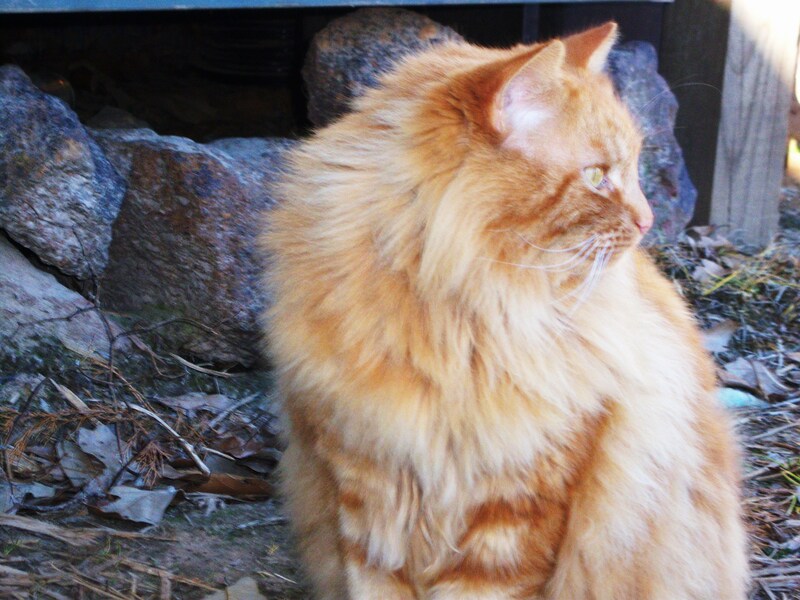 I run inside and pass my darling fluffy giant orange kitty. He has been fighting. He is wet, bedraggled, limping and has a large amount of black fur hanging from his kitty lips. I pat his head, check for cuts, toss him some food and keep going. Running late! I throw my lunch, my computer, my daughter and my coffee into my car and back over to the chicken pen to let the birds out. I notice that my hen who has been sitting 19 days moved nests. Chicks hatch at 21 days by the way. I go over, no bloody eggs. TWO days from hatching and a chicken snake wiped us out. Poor hen, now very angry-looking with only 1 newly laid egg. I sigh. I can’t fix it so I head off to work. I get 3 miles from the house and realize I left the 2 bushels of freshly shelled peas I picked up for my mother in the fridge. I was supposed to take them to work for her to retrieve. I have no time to go back so I’ll just make an extra trip to town tomorrow. It’s not even 8:00 a.m. Grrrrr…… I washed my incredibly filthy Volvo yesterday. It is now raining and my dirt road has turned to mud. You’re welcome Maydelle. I knew you needed the rain……. Agent Orange, when he hasn’t been fighting. I love your Kitty. I have some pretty sweet baby kittens now. I think he needs a friend. Wow. What a day! I swear, whenever I try and let a broody hatch (which I’ve never successfully done) something happens 2 or 3 days before hatch. That’s the pits! Thank you, I’ve only had chicks hatch out twice and none made it past 2 months. It’s so sad. I’m going to make her a place in my large dog carrier when I get home tonight. Maybe that will work……everybody loves chicken! What a horrible start to a day! Hope today was much better….